KitMonsters – Laura Kidd - She Makes War. The music makers’ guide to making music. 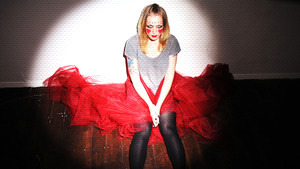 As gloom-pop solo artist She Makes War, London based musician and visual artist Laura Kidd has been releasing music and quirky music videos since 2010. Travelling the length and breadth of the UK on Megabuses and steam trains to support the likes of Midge Ure, Chris T-T, Viv Albertine, Sick of Sarah and Tom Williams and the Boat, she supplements more traditional gigging with playing in the living rooms and kitchens of far flung fans, collaborating with other independent artists and putting on her own shows. Using the language of combat to show that love is a battlefield, She Makes War’s music is about collision - analogue with digital, war with peace and technology with the natural world. Driven by Kidd’s bewitching, pastoral vocals and layered guitars and supported by a plethora of additional instruments from ukulele to autoharp, melodica, piano, violin, harp, saxophone and three part recorder ensemble, She Makes War’s songs are punctuated by a patchwork of field recordings from her global travels as hired gun for the likes of Tricky, The Penelopes and The Young Punx. In 2011, around touring South America as Tricky’s bassist and singing in Carina Round’s band, she won Soundcloud’s Backstage Pass Award and ran a wildly successful Pledge Music campaign to raise funds for recording her second album “Little Battles”, featuring some extra special musical guests including Chris T-T, Tasmin Archer, Annie Gardiner (The Hysterical Injury) and Dana Jade. 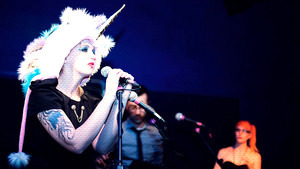 So far in 2012 Kidd has released “Little Battles”, launched a residency / gig series called Breakfast With Apollo and been dubbed the “Queen of DIY” by numerous blogs alongside touring the UK, working on new music videos and making plans for digital DIY collective My Big Sister to launch in September. Full interview with Laura here.